5 Colored File Bags: Package includes 10 zip folders in 5 different colors - Yellow, green, blue, red, white, 2pcs per color. Product size: 13\" x 9\"/34cm x 23.5cm, can store A4 sized files or smaller ones. Quality Material: File bags are made of thickened mesh material, waterproof and moisture resistant. Smooth Metal Zipper, strong and durable. Super Large Capacity: zipper file bags with super large capacity, a good choice as office supplies, or for travelling storage. 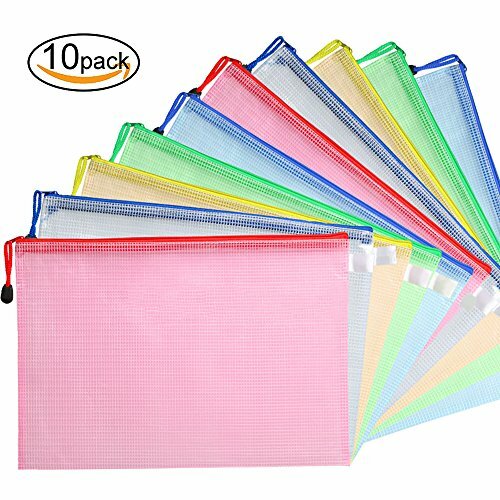 Translucent Mesh Bags: zip folder is translucent, easy to identify your items inside when you need them again, to save your time for storage. Send from U.S.